A dashboard prompt on column A. 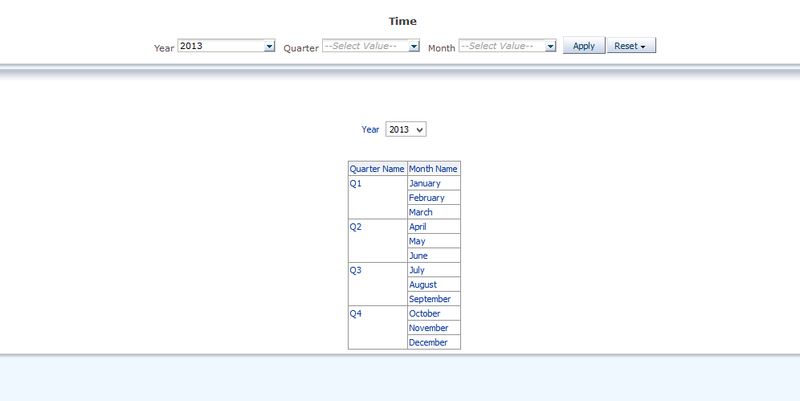 A report on this dashboard, which uses column A as a table/pivot table prompt. Once you click on the ‘Undo drills and view prompt values, the report will run, and will have the dashboard prompt applied. Which is warning the user about some saved selections he’s not aware of. Once the user clicks on the Undo drills and view prompt values, the report displays data as it should be, for the selected time period. 3. Where Is the Problem? The main question is now, where the problem is and how did it started? Let’s see the steps we’ve been through and where it might be. 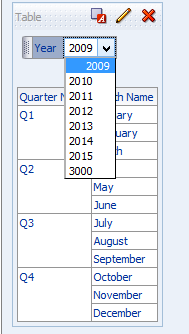 When creating the report, the report prompt column was populated by default, picking up the first value for the column, in the columns default sort order, correct? Well, when saving the report like that, and adding it to the dashboard, we had no actual problem. However, once we played around with the report, trying a couple of other selections in the column prompt, we save it again, with the default value back to the original one. If we now go to the dashboard, we encounter our mysterious error. The report had now perceived, after the various selections, that the last selection is a saved selection which must be run initially on report load. That is the ‘saved selection’ we were not even aware of. If you go to edit your report, in the Advanced tab, you will notice the report XML. You will see in there is a section/tag called ‘staticMemberGroup’. If you still have a version of your initial report saved, and go to the Advanced tab to study the report’s XML, you will notice this report has no section/tag called ‘staticMemberGroup’. Solving? We have two options, so far. XML level option implies changes on the report at XML level. 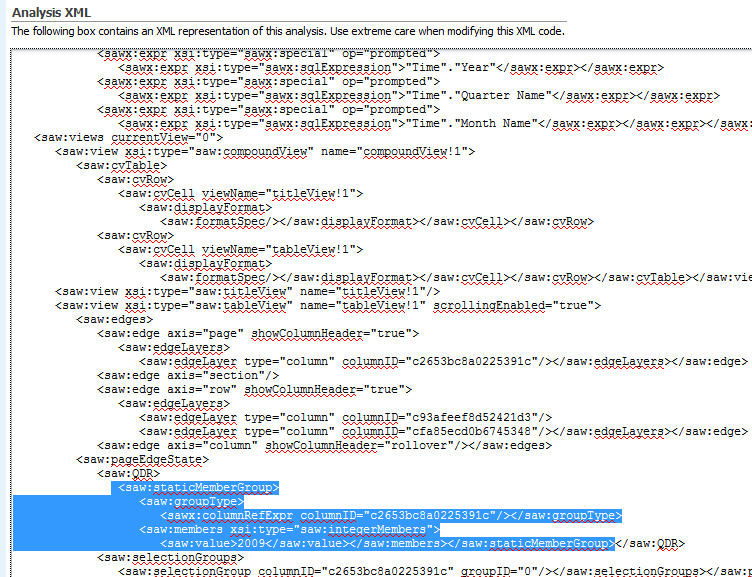 What you need to do is edit the XML and just delete the entire ‘pageEdgeState’ section/tag, and apply the changes. 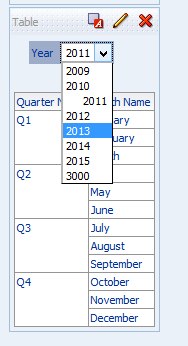 View level option implies changes only on the table/pivot table with prompted column level. What you need to do is edit the view, remove the column from the prompt section (move it to excluded), wait for the report view to load, save it, then move the column back in the prompt section and save the report. I am facing same issue with one of my implementations. I edited XML for deleting ‘pageEdgeState’ sections. It works fine except below scenario. I have a dashboard prompt on ‘product’ column. 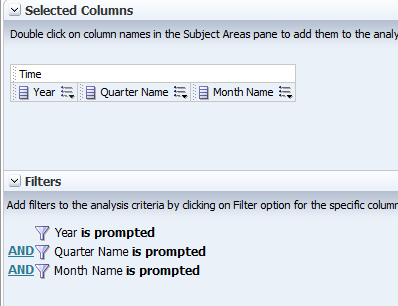 I have a pivot view in the report with ‘product’ in pivot table prompts. If I place dashboard prompt and report on a dashboard page and select A, B from ‘product’ dashboard prompt. Pivot table prompt reflects A, B products with default A product value. if I change product to ‘B’, I get correct result in pivot view. Your suggestions/help will be much appreciated here. Can you sent me the xml for your report, please, for review? If you do click on the Undo link, does that return values for your report? If you change the dashboard prompt default value to C, and run the page, what happens then? Do you still get the ‘…undo drills and view prompts value’ error message? My guess will be that you still have a saved selection within the report, for the specified report. However, the above scenarios and details will give me more details in order to be able to help you out. Thanks for posting the explanation and solution. This helped us a lot. We’ve been scratching our heads on this one. Thanks for posting this. Helped me in solving a similar issue. Thanks for posting this. I am able to fix the issue with your resolution on few analysis but one of them is giving xml error. I am also getting same error message. My dashboard scenario is different then mention above example. but Product Brand is comping from Dashboard Prompt Value, like (Default Value is Product Brand but user can select Product Category, Product Classification and Product Family) for first time its loading correctly. While selecting Product Category or Other Option its giving me the message “‘the layout of this view combined with the data. undo drills and view prompts value’”. and analysis will not run until unless i click on error message. Please note that i have sorted the analysis based on Product Value. Could you please share the XML for this scenario? I need to understand the scenario better. Or, can you try and reproduce this behavior on the Sample apps data model? Parfait! The View Level Option worked a treat. It makes sense thinking about it, as I would have selected a value for the “Send Master-Detail Events” interaction that would’ve been valid for one user yet another wouldn’t have the same visibility. The View Level option is great it works fine. Thankyou..!! I tried the “View level option” and it helped. Thanks a lot! Thanks! It helped to fix quickly.